It's summer, it's hot, and no one wants to be in the kitchen, but the juicy burgers you just grilled up are calling out for French fries. It turns out, you don't need to heat up the oven (and therefore your entire house) at all. Let us introduce you to fries...on the grill! This ingenious cooking method ensures that the spuds still turn out incredibly crispy—and makes it easy to smother the batons in an array of delicious toppings. If you are looking to make a larger batch of fries, just make more aluminum boats, but be sure not to overcrowd them in the aluminum because the fries will steam instead of crisping up and there's nothing more disappointing than soggy French fries. It's also important to use frozen fries. Freshly cut potatoes will not achieve the crispiness you're looking for on the grill. In a medium bowl, toss the frozen French fries in melted butter. 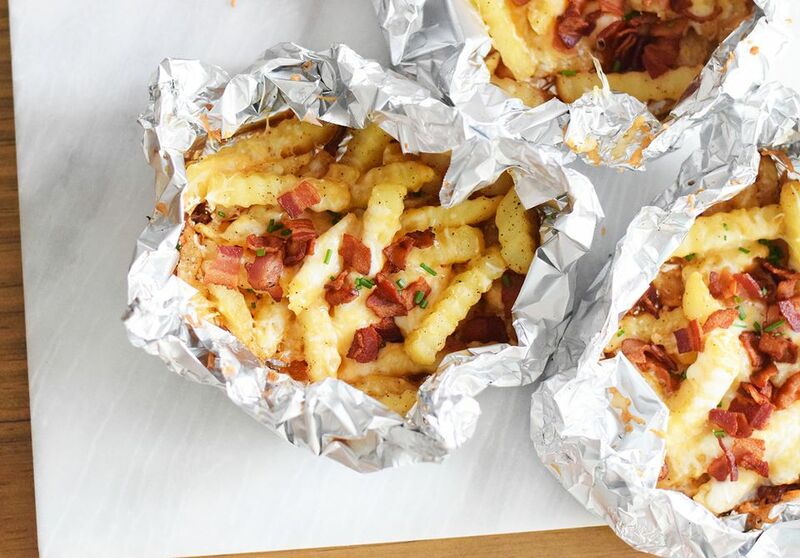 Portion the French fries onto three sheets of aluminum foil. Create a "boat" around the fries with a large opening on top to allow steam to escape. Place the French fry boats on a grill heated to medium-high. Close the lid and cook for about 10 minutes, or until crispy. Flip the French fries and cook for another 10 minutes until the other side is crisp. Set aside. If you are making the bacon bits from scratch, place a cast iron skillet on the grill. Cut the bacon into small chunks and cook, stirring frequently until they're crisp. Remove from the heat and drain out the oil. Top each packet with two slices of cheese and a third of the bacon bits. Place the boats back on the grill and cook with the lid on for another five minutes, or until the cheese has thoroughly melted. Top with chives and any other optional garnishes. Serve with ketchup, mayo, or a homemade aioli. Texas Barbecue: Add pulled pork, shredded cheddar, sour cream, coleslaw, and extra barbecue sauce of course! Tex-Mex: Drizzle some homemade queso, add a dollop of guacamole, and some diced jalapenos. Can't go wrong with creamy and spicy! Greek Style: Make fries fit for the gods! Top them with crumbled feta cheese, olive oil, and lemon juice. Aioli: Drizzle on a simple homemade aioli, some chopped parsley, and a little crushed red pepper flakes for some heat.